GlasWeld operates in over 40 countries worldwide and in the UK has local offices offering windscreen repair with over 100 trained technicians on the road. Glasweld services many of the world's largest fleet operators. These blue chip clients include major companies in car hire, distribution, retailing, and bus / coach operators. The customer base also includes emergency services, utilities, local government and the Ministry of Defence. We also work closely with many of the world's leading insurance companies. At GlasWeld we design and build our own equipment, it represents the culmination of years of research, design and testing by GlasWeld's Technical Services team. It removes both air and moisture from the break. If the chip on your windscreen is no bigger than a credit card, GlasWeld can usually repair it. Our national mobile service will come to you, inspect your fleets' glass on a regular basis and repair, with your permission, any damage found. Draws the highest vacuum possible which evacuates completely and quickly from the break. Vacuum allows resin to fill break completely with GlasWeld's laboratory tested resins, resulting in more secure repairs. The windscreen repair industry first began to gather momentum in the early 1970s, when Novus, Inc. licensed one of the first systems that was capable of optically matching glass. Hap Alexander, a Novus licensee, was trained early on in the new art of glass repair. He saw ways to improve the methods and equipment, and developed proprietary products to advance glass repair quality. Hap founded a glass repair company - GlasWeld, which quickly became an industry leader through its extensive research and development in the field of glass repair and glass protection. The GlasWeld glass repair company expanded its offering in glass repair by developing a system that removed scratches on glass surfaces. 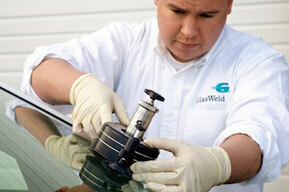 Through independent testing, GlasWeld's Gforce™ Glass Scratch Repair was proven to remove scratches with no distortion. 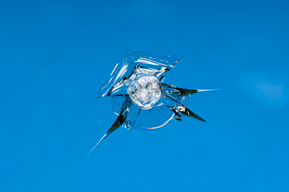 Over the course of more than a quarter of a century, the GlasWeld glass repair company has recognised the need for a comprehensive approach to windscreen repair and glass scratch removal.